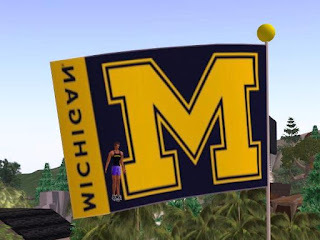 Shan Bright's Huge Rotating Michigan Sign - Showing My Colors to Ohio State Fans! For those of you outside of the United States, or not interested in college sports, you probably have never heard of the Michigan - Ohio State football game, the storied clash between two of the most famous college football programs. For a "true blue" Michigan fan such as myself, or an Ohio State fan, it is the game of the year. And I am celebrating it in style. 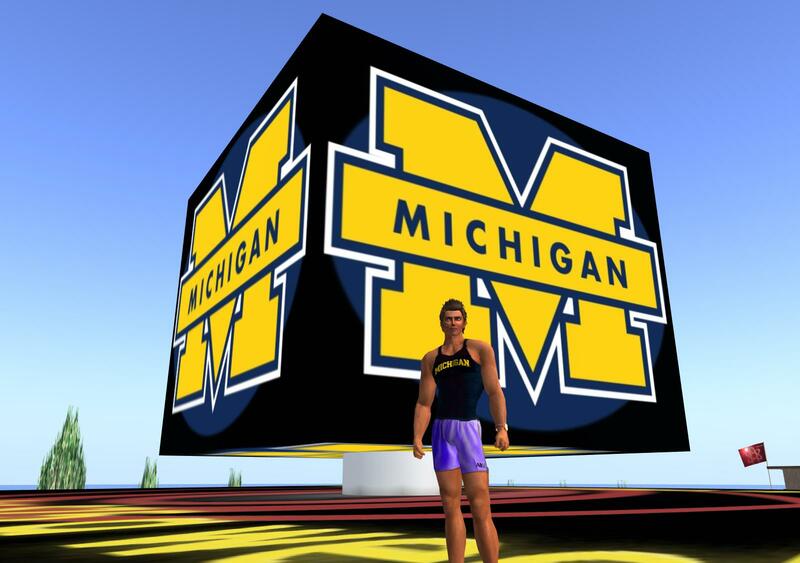 My beloved Michigan Wolverines are favored to win this game tomorrow -- for the first time in 8 years. They have been buried by the Ohio State Buckeyes since 2003. As I reported here 10 days ago, by coincidence, our house is one sim away from the Ohio State Club House. 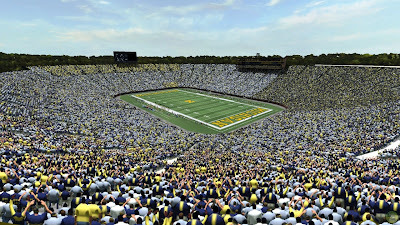 So I decided to fly some Michigan yellow and blue colors within full view of the Ohio State fans. 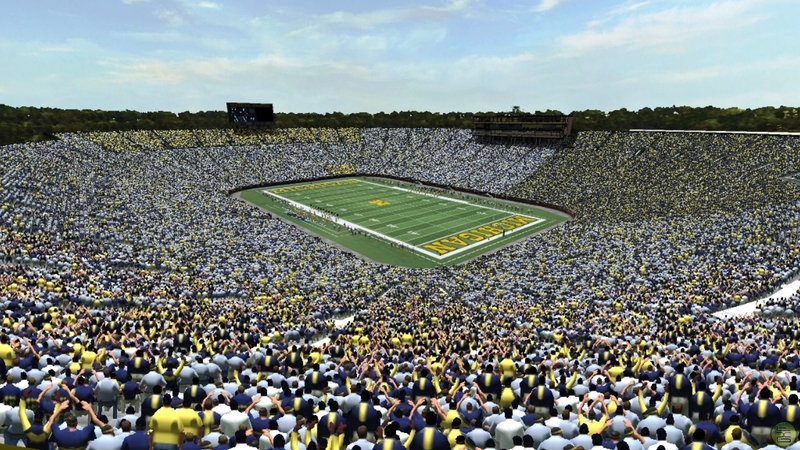 They should be showing the game there on a big screen, and you can go there at about 9 a.m. SL time on Saturday. Make sure to visit the club house to purchase some really cool Ohio State gear if you are a fan. 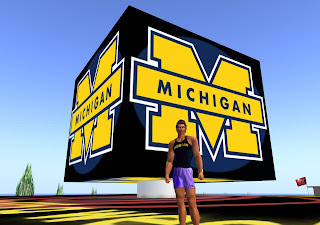 First, I contacted Fig Newt of the Flexi Flag Superstore to make me a giant Michigan flag which he did. You can see it in this photo above. It is about 350 meters from the club house, and can be seen from it -- but not easily. Make sure to visit the store to purchase the best flexible flags on Second Life. 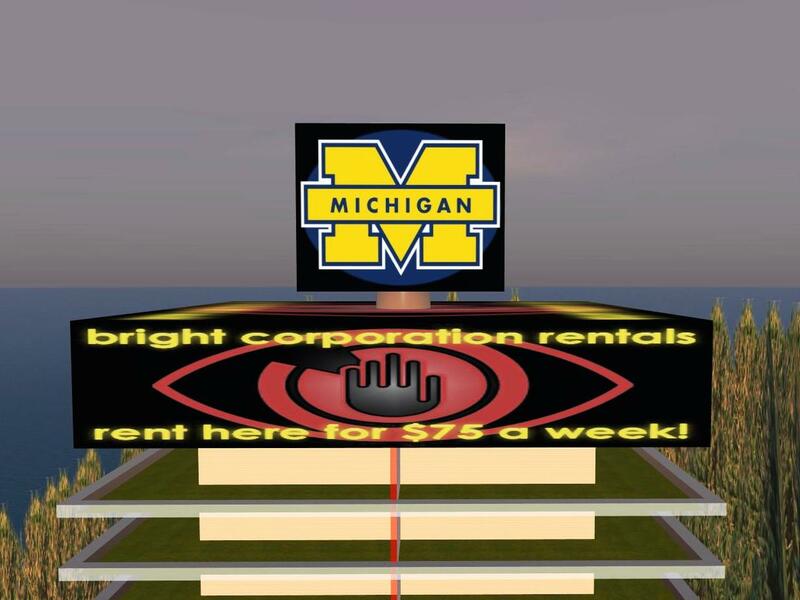 I then contacted Shan Bright of Bright Corporation Rentals and asked her is she could make a giant Michigan Sign visible from the clubhouse on her apartment building 260 meters away. This she did, and it rotates too! Shan rents apartments from 75 linden a week all over Second Life, and you can check her store (she sells lots of great budget items) -- the SLURL is here. 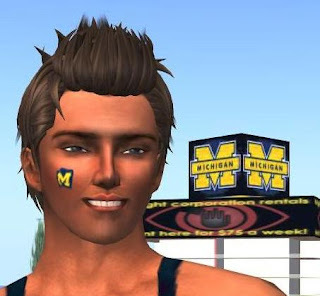 Finally, Jago made me this really cool face tatt of a Michigan flag which you can see me wearing. 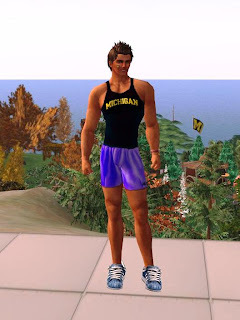 Jago is selling quite a few tattoos on SL Marketplace, and we plan on coming out with a line of College tattoos soon- just in time for the BCS bowl games. Now that you have read all this, make sure to hear The Victors, especially if you are an Ohio State Fan. The world's greatest fight song can put anyone in the mood for a Michigan victory!